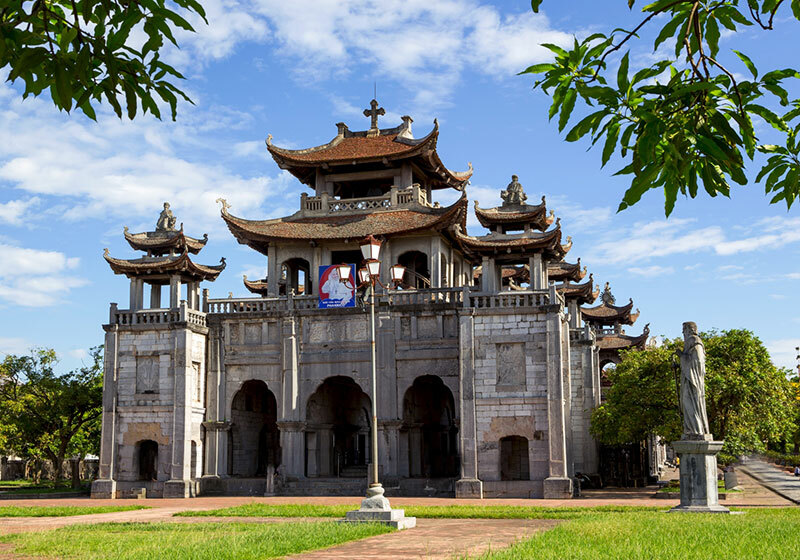 Phát Diệm Cathedral is one of Vietnamese architectural masterpieces, covering over two hectares (five acres) and consisting of a lake, a grand Cathedral with five separate side chapels, three artificial grottoes, and a majestic bell tower named Phương Ðình. Of special interest for the visitor to this particular Catholic Church, is its unique style of architecture, which resembles a budhist temple or pagoda, characterized by several tiers of over hanging curved roofs. The building of Phát Diệm Cathedral was the work of Father Trần Lục, more popularly known as Father Six, the then parish priest of Phát Diệm, and was accomplished in twenty four years (1875-1899). Phát Diệm was a simple parish, eventually becoming the seat of the new diocese in 1901. doubtless to say, had Phát Diệm Cathedral been built by a European missionary, it would probably resemble most other Catholic churches of the time. Instead, it has become one of the most uniquely important churches ever to be built in Asia in the Far-Eastern architecture. Short Description: The Phát Diệm Cathedral is located in Kim Sơn District of Ninh Bình Province of Vietnam. The architecture of Phát Diệm church, built in stone in 1892 is a blend of Vietnamese and European architectural styles called the "eclectic architectural style".